Available as low as $59.99 per oz over spot! The Gold American Eagle is the official gold bullion coin of the United States. Proof coins, such as this 1 oz. Gold American Eagle, are particularly popular among collectors because of the nature of proof coin production. A proof coin is often struck two or more times to create high levels of detail on the coin’s face. Today, you can purchase a 1 oz Proof Gold American Eagle coin from Silver.com complete with its COA and assay card in sealed packaging. Available in Brilliant Uncirculated condtion. Gold American Eagle coins were first struck in 1986. While the bullion coin was minted in four weights that first year, only the 1 oz weight was struck in the proof Gold American Eagle. It was not until 1988 that all four weights were struck in proof as well. Since 1986, there has only been one year in which the 1 oz Proof Gold American Eagle coin was not struck, 2009. Though popularity of the 1 oz. weight has ebbed and flowed with time, in recent years the 1 oz Proof Gold American Eagle has had the highest mintage level among all four weights. These 1 oz. Proof Gold American Eagle coins available today come with a Certificate of Authenticity (COA) and an assay card inside of the coin’s sealed packaging. The COA and assay card verify the weight, purity, and metal content of the coin inside the package. 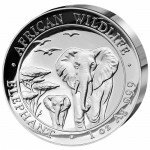 Silver.com offers these coins in varied years of minting, and the exact coin received will be dependent upon availability at the time your order is packaged and shipped. On the obverse side of the Gold American Eagle is Augustus Saint-Gaudens’ iconic depiction of Lady Liberty. His image was first used on the $20 Saint-Gaudens Gold Double Eagle, a coin which is credited with ushering in the Golden Age of American coin design. The reverse side features a bald eagle family in its nest and was designed by sculptor Miley Busiek in 1986 for use on the Gold American Eagle. The United States Mint strikes all 1 oz Proof Gold American Eagle coins at its West Point Mint facility, as indicated by the “W” mint mark on each coin. 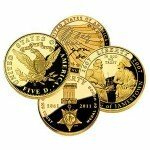 If you have questions about these coins, a Silver.com associate is eager to help. We’re available at 888-989-7223, online using live web chat, or via email.